Are you looking for a truly hydrating and rejuvenating face cream that will unlock the beauty of your skin? Who isn’t, right? I think we’d all agree there’s nothing better than finding a natural skin care plan that works. For many, that can sometimes seem like trial-and-error, but it doesn’t have to be a mystery. When it comes to faces, we all have different skin types, so let’s talk a little bit about how to find a safe and effective natural moisturizer. There are three basic skin types you’ve likely heard about: normal, oily, and combination; however, you could have dry or sensitive skin instead. Keep in mind, though, any skin type is going to benefit from a natural skin care product. But let’s move onto those three main types. Now, if you have oily skin, don’t despair, this skin type requires finding the right regimen. Sometimes your skin might look and feel greasy and with medium to large pores – you might be additionally prone to breakouts. With the right natural skin care products and a little dedication to routine, you face can look and feel just right. Organic ingredients can work wonders for skin, and it’s likely you already have a few things around the house that you can try right now. Those of you with oily or combination skin might want to note that olive oil is an excellent natural face moisturizer that won’t clog pores. And if you’re looking to exfoliate as well, try mixing 1 tablespoon of oil with natural sea salt. As you rub this mixture over your skin, the slight abrasiveness of the salt acts with the deep, penetrating action of the oil to remove dead skin cells, leaving your skin looking rejuvenated. Cucumber has moisturizing properties. 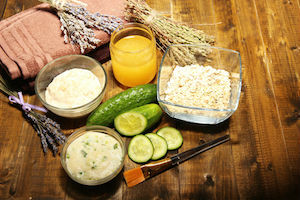 The silica in cucumber is an essential component of healthy connective tissue and is rich in potassium, vitamin C, and folic acid. Blend yogurt and cucumber and gently apply it as a mask. After 15 minutes, remove the mask with lukewarm water. Your will be pleased with the refreshing effects. An intricate but highly effective moisturizing recipe is one with beeswax. Melt 4 ounces of organic almond oil and 1 ounce of beeswax in a stewpot, then remove from the heat. Add 2 ounces of distilled water, 10 drops of vitamin E oil, 10 drops of lavender essential oil, and stir until the mixture has cooled. Apply evenly to face daily or use as a spot treatment for dry patches. After that, you will have an all natural moisturizer for days. What’s the Best Natural and Organic Moisturizer on the Market? While you can use natural moisturizers like coconut or olive oils at home, a face cream like Parfait Visage® offers all those benefits in one and works for a combination of skin types by restoring natural fluid and lipid balance. Penetrates and moisturizes 7 layers deep in the skin. Enhances new cell growth at 6-8 times the normal rate. Not only that, but it is made fresh every month with natural state, cold-pressed oils, and contains no refined, hydrogenated, or bleached oils. So, when will you try an organic skin care product? Tell us in the comments below. Bowe, W. P. & Pugliese, S. Cosmetic benefits of natural ingredients. Journal of Drugs in Dermatology. 13 (9). Fowler, J.F. et al. Innovations in natural ingredients and their use in skin care. Journal of Drugs in Dermatology. 9 (6 Suppl.). Agero, A. L. & Verallo-Rowell, V. M. A randomized double-blind controlled trial comparing extra virgin coconut oil with mineral oil as a moisturizer for mild to moderate xerosis. Dermatology. 15 (3). Sapino S, Carlotti Me, Peira E, Gallarate M. Hemp-seed and olive oils: their stability against oxidation and use in O/W emulsions. Journal of Cosmetic Science. 2005 July-August;56(4):227-51. Shweta Kapoor, Swarnlata Saraf. Assessment of viscoelasticity and hydration effect of herbal moisturizers using bioengineering techniques. Institute of Pharmacy, Pt. Ravishankar Shukla University, Raipur 492010 India. Prev Do you feel Burning During or After Urination here is what to do! THIS IS WHY YOU SHOULD BRUSH YOUR TEETH WITH THESE TWO POWERFUL INGREDIENTS!